Ecozema® is a trademark held by Fabbrica Pinze Schio srl, a laundry products company that has been a leader in the market for over 100 years (clothes pegs, drying racks and other accessories). In 2000 the company launched a research & development project to start a polymer line specifically dedicated to foodservice and based on proprietary injection moulding technology. The idea came up in response to the needs of school and hospital canteens, as well as fair and event catering facilities, with specific regard to organic waste collection to be later sent to composting. In this specific area, one of the bigger problems is sorting and disposing of waste. 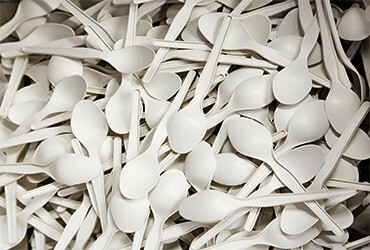 The use of biodegradable cutlery and compostable plates and cups instead of the current PS (polystyrene) ones – which must be necessarily sorted during the wet waste (food leftovers) disposal phase in view of thermal treatment (processing in Waste-to-Energy plants) – completely gets rid of the sorting process, in that Mater-Bi® products can be disposed of and sent to compositing together with the organic wet waste. In 2005 Ecozema® was the first company in the world to be certified under the EN 13432 standard for its cutlery made with Novamont’s Mater-Bi®. 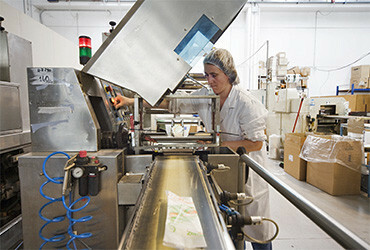 In 2008 it was awarded a supply contract with the Catalan regional government in Spain, being the only company in Europe manufacturing products certified under the EN 13432 standard. Today Ecozema® is partner to many organisations and events in its effort to promote and support proper waste management with its products and expertise. The company is part of the Bio4Expo project because it believes in the ability of Italian companies to work together and accomplish common business and sustainability goals, proving to be able to compete internationally by leveraging the excellence in terms of research applied to the environment.